Homeowners know that saving energy is a sure way to save money. An easy way to find out how to save energy is to perform a self-audit of your home using an app like HomeSelfe. HomeSelfe takes less than 5 minutes and presents you with an analysis of your home’s current energy use, as well as clear ways to both increase your home’s efficiency and lower your utility bills. Once you’ve begun to make energy improvements—and seen lower bills—you can continue to increase your energy efficiency with the following energy savings tips: smart ways to save from floor to ceiling, from inside to out—all year round. 1. Make sure your air conditioning and heating units are ENERGY STAR models. 2. Set a non-ENERGY STAR air conditioning unit to “Quiet Guard” or “Power Save” mode. 3. Get a programmable thermostat that will automatically turn your AC and heater on or off to save on energy. 4. Always keep windows and doors tightly shut when running the AC or heater. 5. If you have central AC, close the air vents in unused rooms to avoid cooling or heating unused spaces. 6. Turn off kitchen or bath exhaust fans as soon as possible. 7. Use ceiling fans to cool a room instead of turning on the AC. 8. You can set your thermostat to slightly higher temperatures if you have ceiling fans installed! 9. Reverse your ceiling fan’s direction to run clockwise and at low speed so that the room air is being pulled up, and warm air is distributed from the ceiling down into the room. 10. Keep your thermostat settings at around 68-70 degrees Fahrenheit during the day and between 65 and 68 degrees Fahrenheit at night to save on heating costs. 11. Remember to reduce the temperature setting on your thermostat whenever you leave the house. 12.Turn your ceiling fan’s blades so that it runs in counter-clockwise direction. This will direct the air downward into the room and create a cooling wind chill effect. 13.Try to keep the difference between the temperature of your thermostat setting and outside temperatures to a minimum. The bigger the difference, the more energy you will lose. 14.Increase temperature settings on your thermostat when you leave the house – there is no need to keep cooling excessively when no one is home. 15.Consider turning your AC off entirely every time you leave your house or apartment, especially when you are traveling for business or leisure. 16.Cleaning your air conditioner and heater’s air filters at least once a month. 17.Check if any ducts to your heating or cooling equipment are leaking and fix them to increase efficiency levels. 18.To keep your central air conditioner unit working efficiently, clean the outside compressor on a regular basis. 19.Keep plants at least one foot away from an outdoor AC unit to provide sufficient airflow. 20.Plan to have your entire heating system inspected by a professional on a regular basis, especially if it’s natural gas. 21.Invest into an energy-efficient heat pump to save on heating costs. 22.Electric baseboard heating can be very effective. To keep it that way, you should leave a clearance of at least three inches under the heating unit and avoid placing furniture or draperies too close to it. 23.While portable heaters are very convenient, they also waste a lot of energy. Limit your use of the same and opt for the regular heaters instead. 24.Check your roof and basement for water leaks. Insulation that gets wet is ineffective! 25.Seal any cracks in the attic, basement, or crawl spaces with materials like caulk and spray foam. 26.Block gaps around windows and door frames with weather strips or draft guards. 27.Beware: air vents blocked by drapes, curtains, and furniture can increase heating costs. 28.Make sure your walls are insulated properly to prevent energy loss and shield your home from outside temperatures. 29.Cover bare floors with carpeting or rugs to help insulate your home. 30.Shut the damper in your fireplace when it is not in use to keep warm arm from escaping. 31.Keep the doors inside your home open to allow conditioned air to circulate freely. 32.Most homes come equipped with about 3 inches of insulation in the attic. You can easily upgrade this to 12 inches to reduce both heating and cooling energy usage. 33.Replace incandescent light bulbs with LED or CFL models, which are slightly more expensive to purchase, but will last longer and save you significant amounts of energy and money in the long run. 34.If you have halogen light bulbs installed, you should consider replacing them with CFLs, which don’t emit as much heat and use much less energy. 35.When purchasing new light bulbs, double-check that you are purchasing the correct bulb size and brightness for your light fixture to avoid losing energy by installing light bulbs that are too big or too bright for your actual needs. 36.Check all of your light fixtures to see if they have an “Energy Star” label. If not, it might be a good idea to invest into “Energy Star” certified lighting. 37.Manual timer controls are a great way to set certain times during which you want lights or electronics to be switched on. Once that time period ends, all of the connected devices will switch off automatically. 38.Install dimmer switches to control your lights can be a great and simple way to save on energy. By dimming a light, you reduce its wattage and energy output. 39.Install motion sensors in your exterior, which turn your lights on only when something or someone is moving. 40.Similar to thermostats, which control temperature, there are now digital systems you can install that control lights throughout your home. Some even offer remote control features through a connected mobile app. These digital systems can help you determine the most efficient use of light and automate the turning on and off process. 41.Reduce the overall amount of free standing, redundant lights throughout your home to avoid turning them on out of habit. 42.If you want to increase the efficiency of your free standing lights, try installing light-colored lamp shades and placing them in corners, because from there they will reflect light from two walls instead of just one (especially in front of bright wallpaper). 43.When purchasing a new home or installing new windows, keep an eye out for the “National Fenestration Rating Council” label, which certifies energy-efficient windows. 44.Installing light-colored curtains is a great way to allow sunlight to enter and brighten the room without inviting too much heat. 45.A natural way to shield your home from sunlight is to plant trees on the sunny side of the house. 46.Make use of your shades by blocking sunlight from entering your home during the day in the summer. This will help keep it cool inside. 47.During the winter, leave the shades wide open during the day, which will allow the sun to heat your interior with natural, free energy. 49.At night, keep shades shut all around the house to keep warm air in. 50.Upgrade to reflective roofs to reduce heat buildup. 51.You can also applying reflective coating to your existing roof to slow down deterioration. 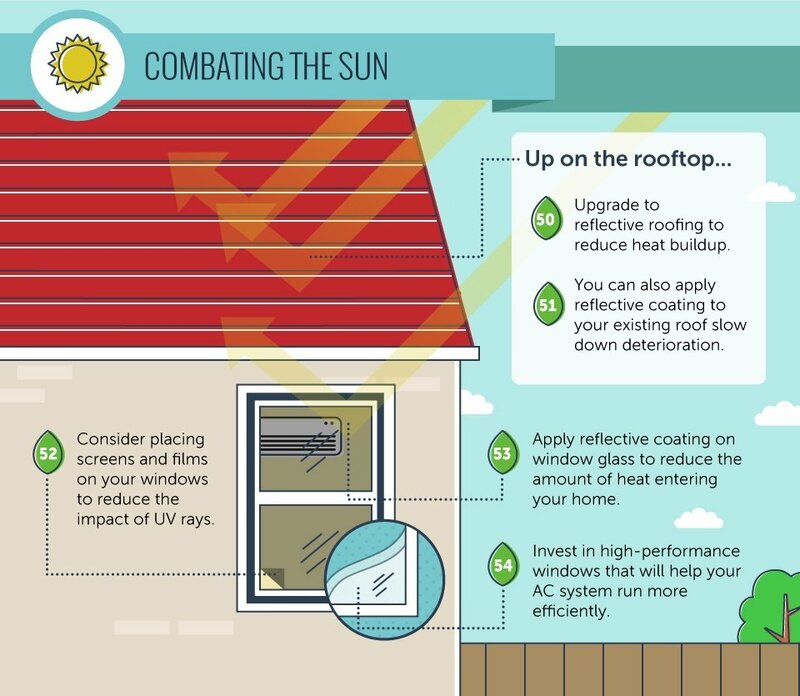 52.Consider placing screens and films on your windows to reduce the impact of UV rays. 53.Apply reflective coating on window glass to reduce the amount of heat entering your home. 54.Invest in high-performance windows that will help your AC system run more efficiently. 55.Use the power-save mode on your refrigerator (if available). 56.Set the temperature to somewhere between 30 and 42°F. 57.Refrigerators purchased in or before the 1990s are “energy vampires.” Replace them with ENERGY STAR units as soon as possible! 58.Did you know that an empty fridge uses more energy than a fully loaded one? Probably not. So make sure to keep it stocked and consider filling the freezer with large containers of water. 59.A slightly inconvenient yet simple way to increase your refrigerator’s efficiency levels is to dust its coils, which are located on the back. 60.Check if moisture is collecting or if you can feel cold air around the closed door of your refrigerator. If yes, it might be time to repair the door seals to avoid wasting energy. 66.Do you really need that second fridge in the garage or basement? Probably not. Get rid of it and save energy. 62.When your meal is almost finished, try turning off your oven or stove burners early. The remaining heat, in most cases, is enough to finish the cooking. 63.When heating up leftovers, considering using the microwave and toaster oven, as they will use less energy than your conventional oven. 64.Opening and closing the oven causes temperature changes of up to 25 degrees. So keep the oven door closed while cooking to avoid making it “work harder” to maintain high temperatures. 65.Immediately clean your ove55n after cooking or baking, because a clean oven has much shorter warm-up times than a dirty one. 66.When preparing a meal with many ingredients, take as many as possible out of the refrigerator at once to avoid opening and closing its door; every time warm air enters the unit, it ends up having to use more energy to cool down again. 67.Some stove models provide burners with different sizes. If that’s the case with yours, try to find a pot that perfectly fits the burner on your stove, because small pots don’t need all the heat of a big burner. 68.Copper-bottomed pots and pans are a great investment if you would like to use heat more efficiently when preparing food on the stove. 69.Pay attention to stove reflector pans and keep them clean so they can reflect more heat upward. 70.Not every pot has a lid, but if it does you should definitely use it because it can contribute to building up heat much faster and shorten your overall cooking time. 71.If you have a door separating your from the rest of the house, try keeping it open during winter months to let the warm air around the oven and stove help heat your home’s interior. 72.While it’s nice to feel some of the oven heat when baking or cooking during colder months, it can unnecessarily heat up your home during the summer. So consider preparing meals on the grill outside to avoid AC overuse. 73.Use the “economy mode” setting on your dishwasher as much as possible. 74.Start your dishwasher only once it’s full, to avoid washing a smaller amount of dishes over the course of several washing cycles. 75.Turn off your dishwasher as soon as the wash cycle finishes, then air-dry the dishes. 76.Only do laundry when you can use the machine at capacity, otherwise you’ll end up doing more frequent washing cycles with smaller loads and waste energy that way. 77.What many don’t know is that laundry detergents work just as well with cold as they do with warm water. So keep your washer’s temperature setting on cold to avoid wasting energy for no reason. 78.If you do not have enough laundry to wash a full load, change the settings so the washer uses less water. 79.When doing laundry, try to wash and dry more than one load at once, so that you can take advantage of the dryer’s leftover heat and put in the second load when it is still warm. 81.In order to keep your dryer’s efficiency at the highest level, clean the lint filter before every load. 82.Check on your clothes earlier than usual when they are in the dryer. They might already be dry. Over-drying not only wastes energy, but also causes static and sometimes wrinkling. 83.Make sure that your dryer is venting to the outside – especially during summer – so that your AC unit does not have to work extra hard to keep it cool inside. 84. Always turn off all your electronic devices when you are not using them. 85. Unplug electronics that are not in use to prevent them from using energy. 86. Unplug a device AND it’s charger as soon as the battery has is recharged! Even if your device is unplugged, chargers will continue to use energy. 87. Adjust your TV and computer screen settings to lower contrast and brightness levels, but make sure that you are not damaging your eyes as a result. 88. When purchasing a new TV, make sure to get a model that is “Energy Star” certified. 89. Change or turn off its factory settings, because newer models are mostly set to “showroom” mode, which uses much more energy. 90. Instead of getting a desktop computer, invest your money into a laptop. It will be more convenient and energy-efficient. 91. Computer screen savers can be fun, but they also use up energy. Instead, adjust your computer settings to sleep or hibernate mode for longer periods of inactivity. 92. Fix any leaky faucet or showerhead immediately! 93. Also frequently check your hot water pipes, especially older ones, for leaks. 94. Shorten your hot showers, or use lukewarm water instead. 95. You can install low-flow faucets and showerheads to reduce your use of hot water. 96. Consider reducing the temperature settings of your water heater to about 120 degrees Fahrenheit. This is plenty to keep your water hot enough for everyday use. 97. Some water heaters come with built-in timers, but if they don’t, you might want to connect it to a manual timer. Either way, it is a good idea to set it to be turned off when no one is home. 99. A small and cheap trick to save on energy when it comes to your is to insulate the first six feet of the water pipes connected to the unit. 100. Save energy by insulating your old unit with insulation wrap. Make sure to keep any vents uncovered. Want even more tips to save energy and lower your bills? Check out HomeSelfe’s newest guide 100 Ways to Improve the Energy Efficiency Your Home here.